Ingrown hairs aren’t a serious health threat, but they are definitely irritating and embarrassing. According to Web MD, the unsightly bumps form when hairs grow into the skin rather than out. Ingrown hairs happen when pores get clogged and the hair follicle is forced to grow in an unnatural direction. While you can potentially get an ingrown hair on any part of your body, it is more likely in areas that you shave. Once the bumps form, they can become painful and filled with puss. Some people opt to wait it out and let the ingrown hair mend itself. However, this can take quite some time. Rather than do nothing, check out the following home remedies. According to an article published on skinVERSE, crushed aspirin can effectively treat ingrown hairs. 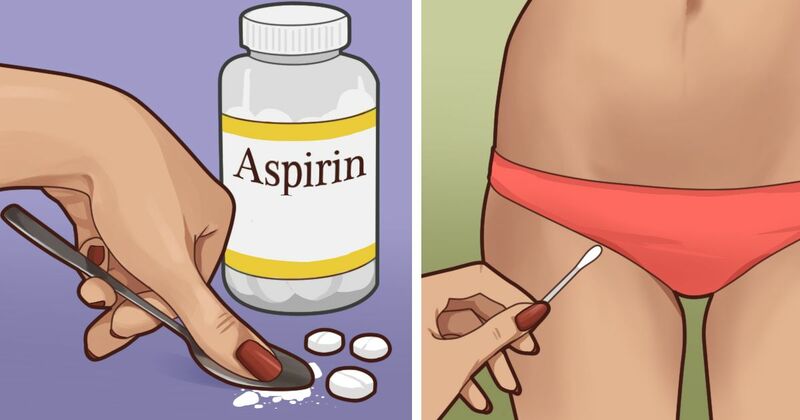 The acid found in Aspirin works to cleanse the skin and help heal the infected area of skin. All you've got to do is crush 3-4 Aspirin and mix with water until paste forms. Apply it as a mask on your face and allow it to dry. Rinse thoroughly. Don’t throw out your old bread. Instead, use it to treat your ingrown hairs. Home Remedy Shop indicates that warm milk and outdated bread can work to unclog the pores so that you can unloop the hair. To use, simply heat up milk and dip a piece of bread in it. Place the wet bread on the ingrown hair until it cools. Once the pore starts to soften, you can use a needle to unloop the hair and get instant relief. Salt works to not only scrub the skin clean but also promotes blood flow so that the pore opens up. All you've got to do is mix ½ tablespoon of salt with one cup of water. Use a cotton ball to soak up the solution and apply directly to the ingrown hair. Do not rinse off the mixture. Allow it to set on the skin overnight. Sugar works to remove gently the dead, damaged skin associated with ingrown hairs. Simply mix a scrub that includes sugar and olive oil. Apply the concoction to the skin and allow it to set for 10 minutes before rinsing. Home Remedy Hacks describes honey as a soothing solution for ingrown hairs. It works to reduce swelling a skin cleanser. To use, apply a generous amount of honey to the ingrown hair. Be sure to coat the entire area. Allow it to settle on the skin for 10 minutes. Rinse thoroughly. Repeat 2-3 times per week. Heat is known for opening up the pores and making it easier to remove the ingrown hair. All you've got to do is soak a washcloth in boiling water. Apply the hot cloth directly to the skin. Repeat until the bump opens up for easy removal. Did you find these tips for ingrown hairs helpful? Share this article with your friends.